One of the evergreens, besides the one that more CO2 is needed to grow more lettuce, is that the effect of CO2 in the atmosphere is saturated. Part of the TL:DR to this is actually interesting and in the optional reading below, but the short of it is that the role CO2 plays in the atmosphere is to radiate a considerable amount of energy to space. This is needed to balance the energy coming in from the sun. In the atmosphere the higher you go the colder it gets till you hit the tropopause. The effective level the CO2 can radiate to space from rises linearly with the increase in concentration. Until the effective radiative level is above the tropopause, adding more CO2 slows the emission to space and thus the surface has to warm in response. Eli has written on this before. 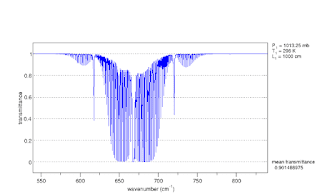 If you look at the emission spectrum from way up high the sharp spike in the middle of the CO2 band is where the concentration is so high that radiation cannot be emitted to space except high up in the stratosphere. Everywhere else in the CO2 band emission is occurring in the troposphere (you can tell by looking at the temperatures, and you can tell by looking at the emission) and adding CO2 will decrease the amount of emission in the CO2 band. Now the interesting stuff. The optical density in the CO2 band below the effective radiative altitude is so high that any emission in that region is absorbed, at the surface in the first kilometer, on line center in the first 10 m. The temperature in the first 10 m is essentially that at the surface. That means emission from collisionally excited CO2 will be strong, with roughly half going back to the ground. Increase CO2 and the backradiation will increase proportionally because there is more CO2. That means by definition that much of the greenhouse gas effect on surface temperature is local to a few meters above the surface. Worse, the stronger low lying backradiation slows down convection although it will speed up evaporation.
" Increase CO2 and the backradiation will increase proportionally because there is more CO2." Is that really true? I thought with high optical density it went the other way. You're getting full BB intensity in that band (at surface temperature), and you can't get any more. It's at lower optical density bands, where at least part of the IR is coming from hundreds of metres up, where it is cooler, that there is scope for variation. More CO2 can mean more of the IR comes from lower levels. Don't forget that nowadays (and in the future) the larger impact on surface temperature comes from the way the warmer ocean surface is increasing the amount of water vapor in the atmosphere, because CO2 concentration is high. I've been surprised to see that observation platforms don't keep a really close eye on humidity, clouds, albedo, and outgoing long wave on a very comprehensive and integrated basis, focusing on 65 north to 65 south latitude to present a coherent view of how the different factors are connected to the surface temperature anomaly. There's also an odd factor i never see discussed in detail: water doesn't evaporate from a water body like it used to. Do a search about this topic, and you'll see it's seldom discussed. I have been playing around with this by placing a wet orange on a dish by a closed window. I measure the temperature and the amount of light, look up the humidity, and I see a weird effect: for the same amount of orange surface temperature and room humidity, the orange dries faster on sunny days when the sky is blue. But if the sky is whitish, and all other factors are the same, the orange dries slower. It seems the spectrum of the light hitting the orange has an effect on the way water molecules "lift off" the orange. There's a band I'm not measuring with my photometer or some sort of polarization effect I can't measure. Any thoughts? Nick, what you say is implicit in the argument also the solid angle at which the radiation would strike the surface increases with decreasing altitude. Fernando, one of the reasons why evaporation could decrease is thin films of oils (bio and human generated) on the surface. It gets hugely complicated because the way out of that is surface turbulence. as to color, well yeah, blue light is more energetic. FL: I've been surprised to see that observation platforms don't keep a really close eye on humidity, clouds, albedo, and outgoing long wave on a very comprehensive and integrated basis, focusing on 65 north to 65 south latitude to present a coherent view of how the different factors are connected to the surface temperature anomaly. BPL: I'm surprised--no, I'm not really surprised--that you don't know that they ARE. Google "International Satellite Cloud Climatology Project" for just one example. Eli, saturation of carbon dioxide bands does not happen close to the ground at all wavelengths. Barton, Essenhigh's numbers that you use for band absorption strengths are misleading on many grounds. First, they neglect pressure broadening. 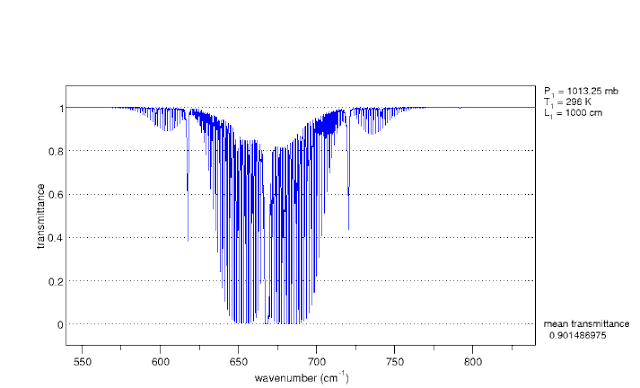 Second, by averaging over the entire absorption band they miss that the optical depth of the band center corresponding to the transition to one quanta in the bending mode is blocked on line centers after about 10 m. Third, they are particularly misleading wrt water because in the water vibrational spectrum the lines are quite far separated from each other and the overlaps between CO2 and H2O are comb like. Fourth except for the 15 micron band the other absorptions of CO2 H2O are too short wave to have much to do with the greenhouse effect as such, although they do play a role in the atmospheric absorption of sunlight. where u is the mass path, P and T the temperature, Po and To reference values (I usually used Po = 101,325 Pa and To = 288.15 K), and m and n constants, different for well-mixed gases, water vapor, and ozone. Any way I write a radiative-convective model, I do not get saturation always within the first ten meters. At exact band centers, maybe, with a little plus-or-minus due to uncertainty, velocity, and pressure. I think I see the problem. We're posting at cross-purposes--I'm thinking in terms of band models and you're doing line-by-line. You are correct. I concede. I wonder how close a simpleton model matches reality? I think if CO2 as insulation. Put on a shirt, and the shirt warms and dampens (increasing evaporation) until it losses heat at the same rate as your skin had previously. The "elevation" of the shirt is a few mm's above skin level. The process repeats every time a new layer is added. The moon, having no atmosphere, would be a "shirtless" body. The steady state is at ground level. Observations of thermospheric infrared radiative cooling by carbon dioxide (CO2) and nitric oxide (NO) from 2002 to 2018 are presented. The time span covers more than 6,000 days including most of solar cycle (SC) 23 and the entirety of SC 24 to date. Maxima of infrared cooling rate profiles (nW/m3) are smaller during SC 24 than SC 23, indicating a cooler thermosphere. Rates of global infrared power (W) from CO2 are now at levels observed during the deep solar minimum of 2009. Rates of NO power are still larger than those observed during 2009 and are being maintained at an elevated level by geomagnetic activity. During SC 24 to date, the thermosphere has radiated 70% of the energy of the mean of the past five cycles and would require an additional 1,690 days at current infrared radiation rates to reach that amount. Hank, have to look at the paper, but the thermosphere is way high up, with a density about that of Mars or less. If the mechanism is driven by absorption of IR from below it would be similar to stratospheric cooling. So that's 70 percent of a small amount, not a big deal? I was thinking it's off the top of the atmosphere so represented everything going out to space.